I have an aversion to graphic books of all shapes and sizes. Why do you need to combine all the graphics of a comic book to tell a story when you can just publish a standard book, the kind printing presses have been producing for 500 years? 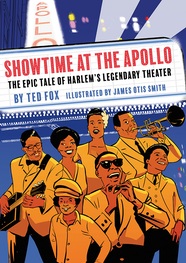 I have changed my mind, thanks to Ted Fox’s just plain wonderful Showtime at the Apollo: The Epic Tale of Harlem’s Legendary Theater, a brand-new, delicious graphic book from Abrams ComicArt, illustrated by artist James Otis Smith. It is not only a graphic book, but a graphic history book, and there are few of them around. It is the story of the legendary Apollo Theater in Harlem, New York, a 1,000 plus seat house on 125th Street that for generations has been a showcase of black entertainment in America. It has featured just about every African American star: Ella Fitzgerald, Billie Holiday, Diana Ross, Moms Mabley, Lionel Hampton, the Jackson 5, the Four Tops, the Temptations, Sammy Davis Jr., and Stevie Wonder, among others, plus white performers, too. The book is being published now to commemorate the 85th anniversary of the theater. Fox’s work is a new, illustrated version of his 1983 book Showtime at the Apollo: The Story of Harlem’s World Famous Theater. Fox takes the reader all the way back to 1914 and discusses entertainment in Harlem, and New York City, in that bustling era when vaudeville was sill king to set the stage for the debut of the Apollo in 1934. This is a history book but Fox and Smith have turned their stars into very personable people that you come to admire and get to know well in its pages. They have ‘novelized’ non-fiction history and give you an engaging, rich tale of one of America’s musical landmarks and the performers who made famous. Do not be put off by a graphic novel presentation of entertainment history. It is like sub-titles to a movie – in five minutes you get used to it. The story of the fabled Harlem theater is full of ironies. As an example, it was built and run for twenty years as Hurtig and Seamon’s Burlesquer house prior to its opening as the Apollo, a white only emporium. Throughout the years, some of the big acts for the black theater were white performers, such as Tommy Dorsey and his swing band, Buddy Holley and Guns ‘n Roses. The family that ran the theater for a predominantly black audience, Frank Schiffman and his descendants, was white. While the theater is famous for its many commercial acts, it is even more famous for its gospel shows. While it was home on many nights to superstar African -American actress/singer Lena Horne, it was also a theater attended by Marilyn Monroe. The theater, famed as an African-American showplace, always had a 40% white audience in the 1940s. The theater, a long distance from the Broadway theater district, draws an impressive 1.3 million fans a year. The Schiffmans not only created a world famous showcase, but a ‘mom and pop’ business in which everybody helped everybody else. As an example, Schiffman would pay an act, say, $300, but write down $1,000 on their contract so they could show that contract to other theater mangers to earn more money from them. The strength of the book is not just its entertainment story, but the way in Fox and Smith fit that story into New York City and American history and cover strikes, protests and riots in Harlem, such as the 1935 riot over a white staff beating of a black shoplifter in a department store across the street from the theater and a 1943 riot over the shooting of a black man by a cop. There is the story of pickets who forced Harlem department stores to integrate their all-white sales force. That history gives the book its heft. Josephine Baker had a special dressing room built for her right off stage. Dionne Warwick lived in an apartment at he pricy Waldorf Astoria Hotel. The Spinners started off as an opening act and were so good as the show’s opener that whenever the Apollo needed an opener, or the opening act canceled, they just called the Spinners, who always came. All new first timers, no matter how famous they were, got dressing rooms on the dreaded fourth floor and had to walk all the way up those stairs after the show. Ella Fitzgerald always provided tables full of food for everybody whenever she played there. One music lover who would frequently show up, unannounced, and spend the whole day watching the show from backstage was Muhammad Ali. In the 1930s and 1940s nationally renowned stars would perform at the Apollo but could not eat at restaurants right across the street because of segregation. Each week during World War II the Apollo sent its stars - people like Lena Horne, Bojangles Robinson and Cab Calloway – to the local USO to meet soldiers. There is a special chapter on Lionel Hampton that tells the marvelous story of the night that, at the end of his performance, Hampton led his band out of the theater followed by the entire audience, and marched down 126th street to the applause of everyone in the neighborhood. Fox decided to break the book up into decades and that helps the story tremendously because, decade by decade, the music changed, Harlem changed and New York City – and – America – changed. It also permits him to carry his performers through the story over the decades and re-create the rich history of the theater. Within this format, the author tells the story of fabulous, oversized characters such as Dizzie Gillespie, but also the stories of many people you never heard of who were the backbone of the theater, such as Amateur Night emcee Ralph Cooper. The Schiffmans invented Amateur Night, the theater’s signature showcase, on Wednesdays, when anybody could perform in hopes of winning the $25 first prize. The winners list read like a who’s who of American entertainment – Sarah Vaughn, Pearl Bailey, Gladys Knight, Leslie Uggams, Dionne Warwick, Jimi Hendrix, King Curtis, Michael Jackson, Frankie Lymon, Wilson Pickett and James Brown. Brown cut a live album at the Apollo in 1962 that became a huge hit. Amateur Night became a television show in the late 1980s. The theater was closed in 1976 and re-opened, under new management, in 1981, losing none of its fame or luster. Oh, the ghosts that could play jazz and dance there every night!